I believe that most human beings have something they love to labor over – something that is time consuming and yet fills us with joy to produce. How else could frescos, croissants, quilts, and War and Peace exist? My labor of love is yeast bread. To be fair, I don’t really think that yeast bread is a laborious task – though one must dedicate a chunk of time, from start to finish, in order to have the desired results of yeast bread. There is no scrimping. My love of yeast bread started with Challah. I don’t remember what prompted me to start baking Challah the first time, or how old I was the first time I made it. In my younger years, I entered it twice in the Iowa State Fair, winning a blue ribbon each time (preview of what’s to come, NO blue ribbon for this batch). Typically, I make Challah around Christmas time, and serve it warm with a mixture of honey and butter as a topping. I have also been known to make Challah for special occasions such as family gatherings and friends’ birthdays. 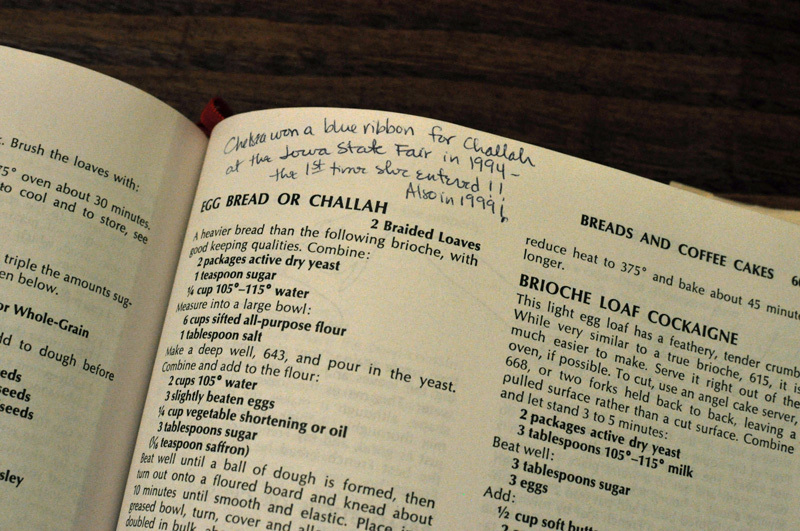 I always use the Joy of Cooking’s recipe from my 1975 edition, the one with the handwritten note about my successes from my mother. I will walk you through the steps to making Challah and do my best to explain the tricks I have discovered over the years, however, I will warn you, my batch this year was a flop. This is no picture-perfect outcome post, but an oh, well, better luck next time. For the first time I can recall, my friends, my dough dropped. The perils of baking yeast bread around young children and babies is the forgotten kitchen timer. I either did not set mine, did not hear mine, or the kitchen goblins who leave piles of dirty dishes in sinks turned it off for me. In any case, my dough rose and dropped before I could get it into the oven to bake. However, since I was being watched by little eyes, rather than dumping the entire doughy mess into the trash, I pressed on and baked it anyway. I am finally listening to my young daughter’s toddler voice belting out the chorus to her favorite wintery animated movie about sisters and snowmen and letting it go. 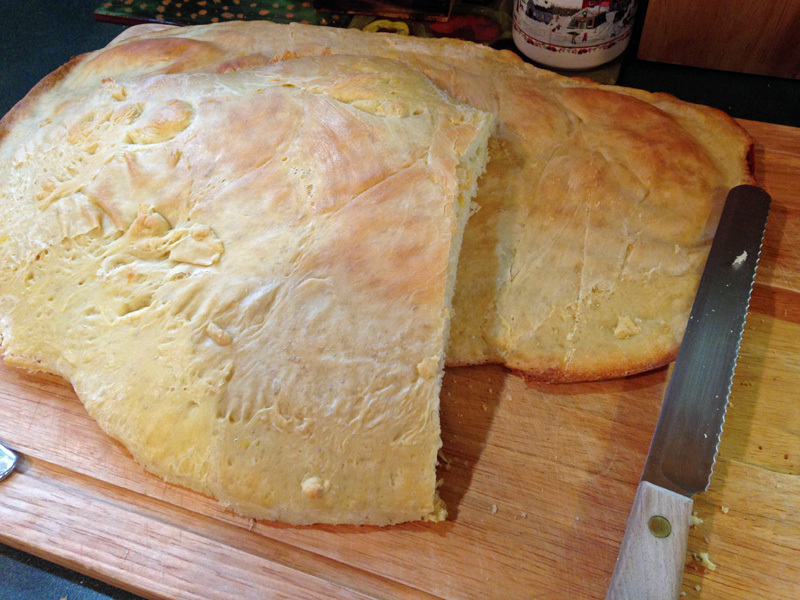 The outcome was a deliciously chewy, still tastes like Challah, but looks more like a focaccia loaf of bread. So, my lesson out of all of this, enjoy the process and move on when it doesn’t work out. I promise to post more of my flops, for the Internet is far to full of picture-perfect images of meals that look as if they only could ever be made in the top restaurants by the top chefs. Enjoy whatever labor of love you create, and above all, do not fear the yeast bread! The most essential element to baking successful yeast bread is the yeast. I know, duh, but bear with me. The most basic recipe for raised yeast bread is flour, water, yeast, and sugar. Fairly simple as long as your understand your ingredients and their limitations. Keeping the temperature just right is important – too hot and you kill the yeast, too cold and it does not rise. This goes for the first mixing of the yeast all the way to the last rise. 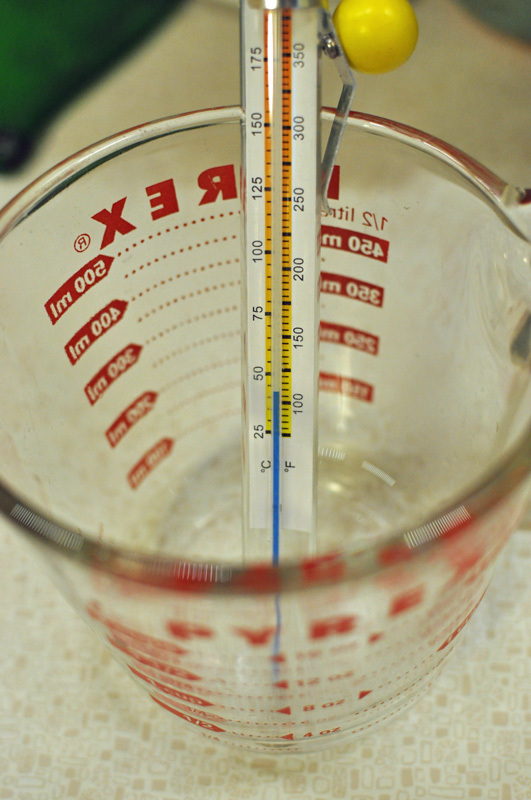 I use a candy thermometer to keep my water just right. I highly suggest The Bread Bible cookbook as a valuable resource on all things yeast bread. Proper yeast, water, and sugar mixtures should go from grainy, left, to foamy, right. Old yeast will cause problems. This is why I store jars of yeast in the fridge, or better yet, if you are an infrequent yeast baker, use packets. Kneading is also oh so important. This is the step that ensures all ingredients are properly mixed together and also helps to remove large air bubbles. If you have ever tried to butter or jelly a slice of bread with a large hole in it, you have seen first hand what poor kneading looks like. 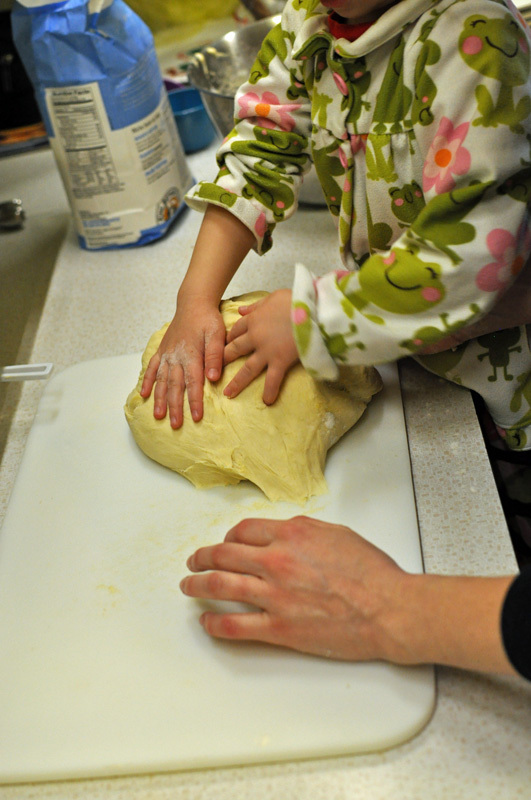 I had my little helper working on her kneading skills for this batch of Challah. She can’t quite get the movements just yet, but she sure was eager to try! Your bread dough will start off rough and sticky, left, and with the help of extra flour and kneading motions, go to smooth and elastic, right. Note, it always takes me longer than the recommended 10 minutes in the recipe! 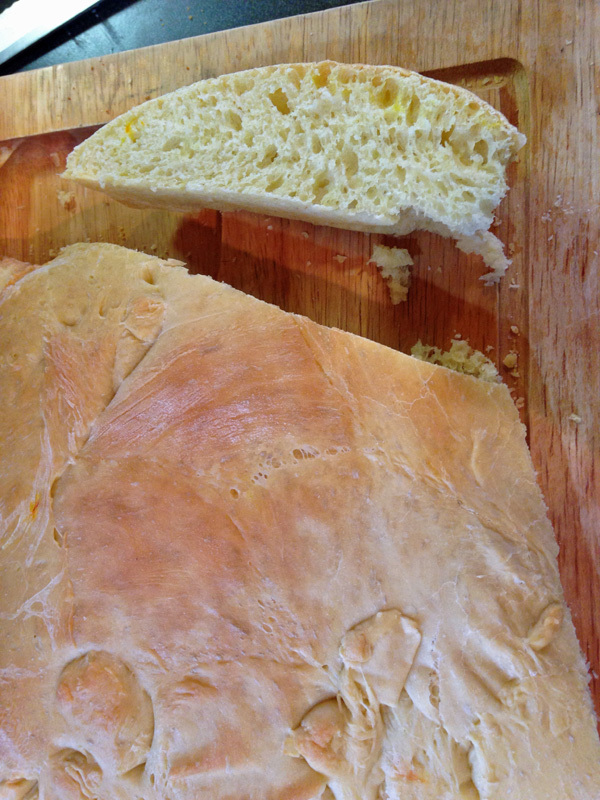 The coloring of this bread comes from the use of eggs in the recipe, hence its other name, egg bread. However, the flavor comes from an exquisite spice known as Saffron . I never use the powdered form, only the stigma from the crocus plant that makes this the most valuable spice in the world. I use a pinch and soak it in the warm water before adding it into the rest of the liquid mixture, just before mixing up the dough. Once the dough is mixed and kneaded, return it to a greased bowl. I use a large mixing bowl that holds over 6 quarts. Cover the bread with a dish towel and let rise until doubled, about 1 hour. Watch it closely so that they yeast does not over rise and then drop. 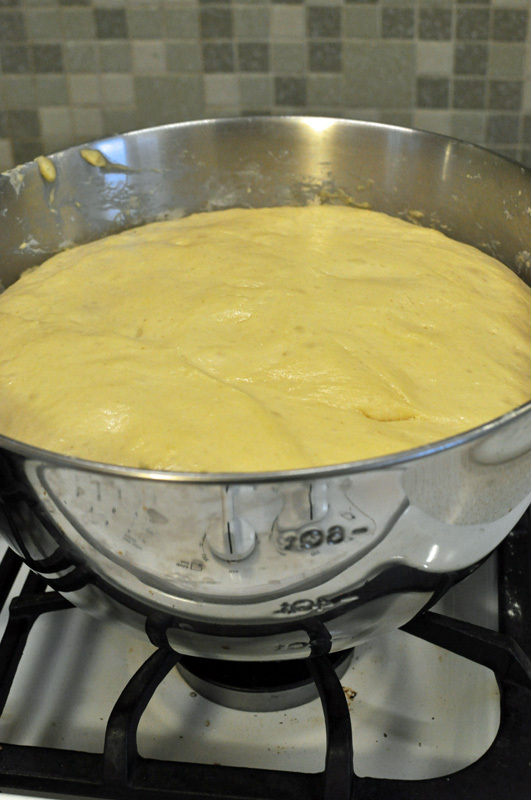 This image shows the dough doubled in size and ready to be punched down and braided into two loaves. Braid into two loaves and place on greased and floured baking sheets. Cover and allow to rise once more until doubled. Do not, I repeat, do not allow bread to rise more than doubled! This is my hot mess that should have been a gorgeously larger version of my first braid. Sigh. Brushing the tops of the loaves with an egg wash before baking, creates a lovely glossy brown finish. I was a little too disgusted with my fallen bread to do such and so mine have a more powdery golden finish. Welcome to flatbread Challah and here’s to turning a new leaf just in time for 2015. Happy New Year and happy letting go! Beat well until a ball of dough is formed, then turn out onto a floured board and knead about 10 minutes until smooth and elastic. Place in a greased bowl, turn, cover and allow to rise until doubled in bulk, about 1 hour. 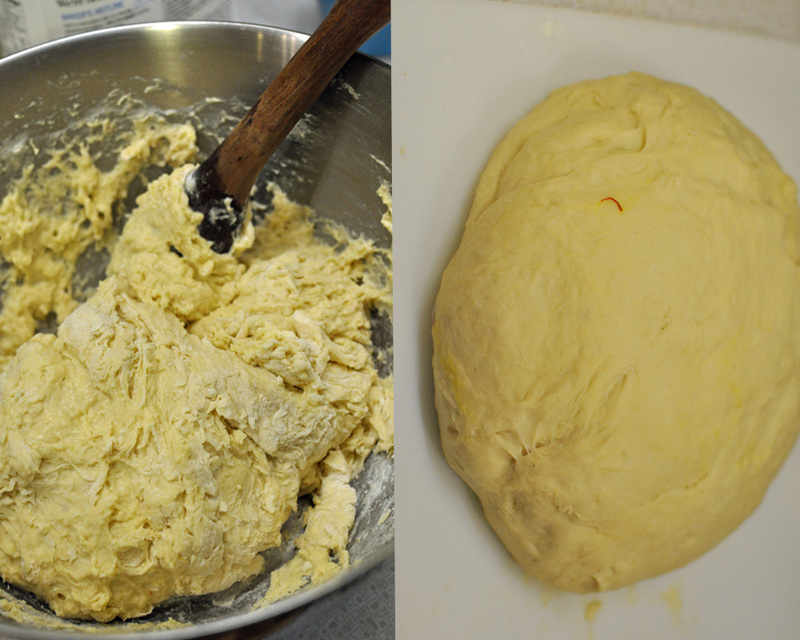 Punch down and divide dough into two sections, kneading each for several minutes. Now, to make the braids. 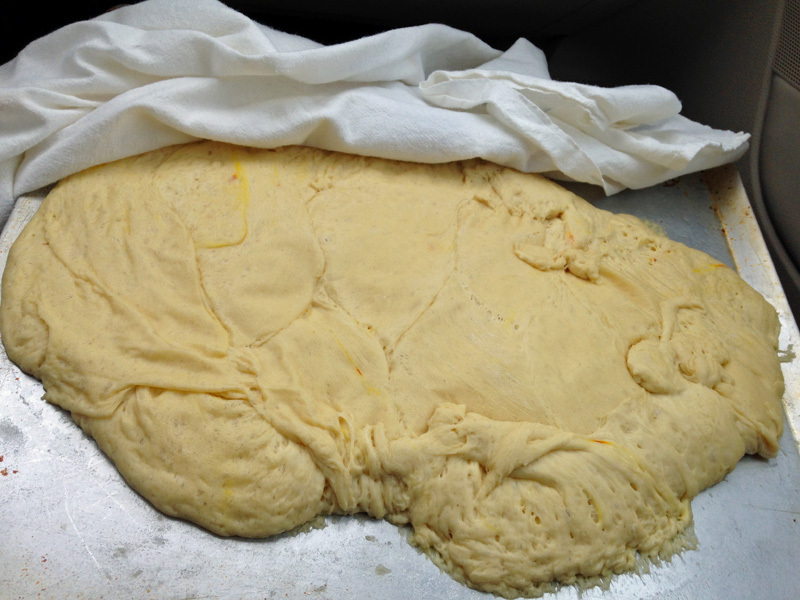 Cut each section of dough into 3 parts and roll between the hands or on a board into long tapered cylinders. 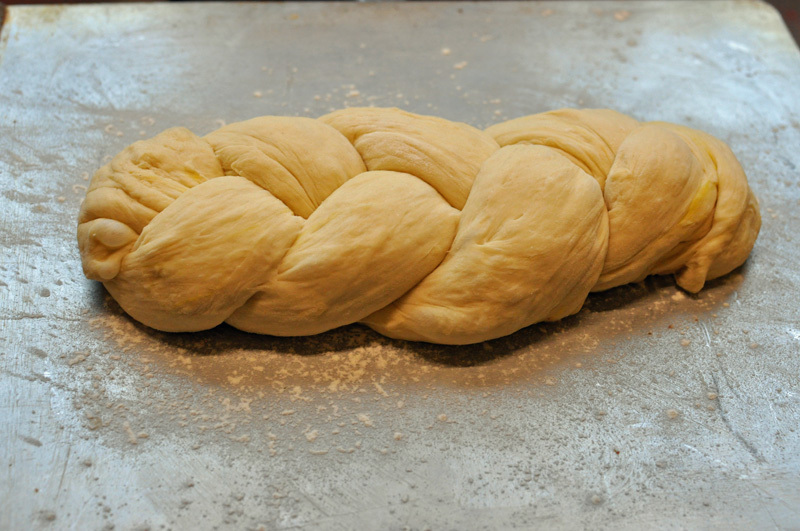 With the three ropes of dough lying side by side on a greased floured sheet, start to braid loosely from center to the end, then braid the other portion from center to end. Finish the ends by tucking them under. Repeat for the second loaf. Cover and let rise until almost doubled in bulk. Brush tops with French Egg Wash (1 egg yolk diluted with 1 to 2 tablespoons of water). Bake 15 minutes in a preheated 400° oven, then reduce heat to 375° and bake about 45 minutes longer or until golden brown on top and hollow sound when bread is tapped.